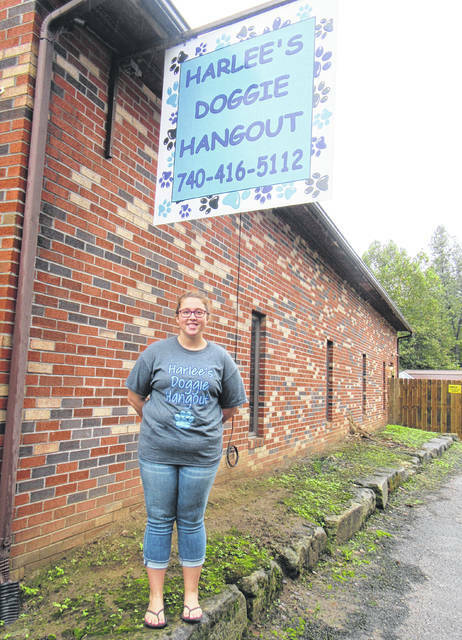 Taylor Hysell is the owner of Harlee’s Doggie Hangout, which is named after her dog Harlee. POMEROY — Harlee’s Doggie Hangout opened earlier this month providing boarding kennel services for area canines. Owner Taylor Hysell explained that she has always wanted to do something working with dogs, and saw the need for boarding services. Harlee’s Doggie Hangout, named for Hysell’s own dog Harlee, opened on Sept. 1 on Hiland Road, just off of State Route 7 near Pomeroy. Harlee’s Doggie Hangout is located in the former Portsmouth Ambulance location at 33093 Hiland Road, Pomeroy. There is currently room for up to eight dogs at a time, with room to expand should it be warranted in the future. Hysell explained that each of the kennels has its own bed. Dogs will be able to watch television and there are plenty of toys for them to play with. Bowls and toys are provided, with the dog owner asked to bring their pet’s own food. In addition to a kennel area there is a fenced in area for the dogs to go outside as needed. There is also an area set up to give the dogs a bath should they need one while at the kennel. Harlee’s Doggie Hangout offers daily and hourly rates, allowing for care dogs while the owners are at work for the day or on vacation for a week. Dogs of all sizes and breeds are accepted, but they must be up to date on vaccinations, including the bordatella, at least two weeks prior to arriving at Harlee’s. For more information on Harlee’s Doggie Hangout visit them on Facebook or Instagram, call 740-416-5112 or email harleesdoggiehangout@yahoo.com. https://www.mydailyregister.com/wp-content/uploads/sites/24/2018/09/web1_9.27-Harlees_ne2018926135239970.jpgTaylor Hysell is the owner of Harlee’s Doggie Hangout, which is named after her dog Harlee.